3- Insanity Is Now Gun Control -- are you nuts? 4- Cold Dead Fingers... Baloney! Gannett crime reporter Dan Nowicki's headline reads: "1 year after Newtown, gun control still elusive." This shows how bias and bigotry is subtly planted in "news" to advance left-wing agenda. "1 year after Newtown, America's Second Amendment civil rights remain intact, despite media hysteria." Thanks David Rosenthal for the idea. Both sides think they're losing. --The anti-rights people see permits now available in all 50 states (Illinois was the 50th, Wisconsin 49th, all Americans have at least some ability to discreetly or openly carry dangerously loaded firearms in public). This is horrible, a terrible loss, as they see it. --Every effort to enact national so-called "universal background checks" has failed because of the "powerful gun lobby." The fact that it is because the bills have been for universal gun registration, not background checks, and freedom's fight by the civil-rights group they refer to, the NRA, is part of the reason, doesn't play into their twisted thinking. --The Koch brothers' money spoils everything, and it's everywhere. The fact that George Soros and Michael Bloomberg and Hollywood and a ton of others outspend conservatives tremendously doesn't figure into the calculus, but that's OK, the left still figures they're losing at every turn. --The EPA, OSHA, the Forest Service, National Parks and Wildlife and the CDC have all been short stopped from banning lead, an end-run attempt to ban ammunition. It seems like nothing they try works in the effort to disarm the American public, the unspoken but holy grail goal of the gun-hating, hoplophobic anti-rights movement led by Schumer, Feinstein, Boxer, Bloomberg and the entire Democrat leadership. Then there's the other side, us. --The pro-rights Second Amendment supporters are convinced it's an uphill battle with our rights hanging by a thread, which is not an unrealistic view. --The money being spent against us is ginormous, like $1 billion for an anti-gun study group with scores of tenured researchers at Johns Hopkins University whose job it is to concoct studies that say guns are bad and should be removed from society. A thoroughly corrupt media will parrot results without any journalistic effort or balance. A dumbed-down public that can no longer think or reason on their own will swallow it, thanks to a government education system that doesn't educate. --The Firearms Freedom Act, that would finally unravel congressional Commerce-Clause abuse and judicial complicity, is stuck in limbo in a court system run by the most abusive Attorney General the nation has ever known, who is now in Contempt of Congress. Yet he remains in office, refusing to meaningfully investigate IRS corruption, NSA domestic spying, massive ATF gun running to foreign drug lords, presidential supra-legal activity, need I go on. 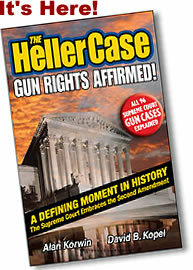 --The battle for gun rights, now frozen at the national level, has been cleverly shifted to the states, where 10% of the states (NY, CA, CO, CT, NJ) have incrementally obliterated rights at the local level, leading to massive civil disobedience, putting hundreds of thousands of innocent Americans at risk of arrest for possession of contraband that a few days ago was legally owned property. Politician perpetrators of the unconstitutional ex post facto criminal syndicate schemes remain at large, with no indictments even pending. --The very man in the White House, sworn to uphold the Constitution, is its main infringer, using undelegated power when Congress refuses to act, and Congress refuses to impeach or even censure him for his actions beyond his delegated authority. He issues a call for "A national safe and responsible gun ownership campaign," which means millions of dollars we don't have, spent on advertising to unload and lock up firearms, because to him, guns are OK as long as they don't work. Meanwhile, schools are black holes of ignorance on firearms education, and expel kids if they eat a toaster cake the wrong way, because it might look like a gun. So, don't feel so bad. Bottom line: The struggle for freedom is a struggle -- it does not end. Meet me at The PrepperFest AZ Expo! March 21-23, 2014, Fri. - Sun. Preparing isn't for doomsday -- it's for everyday. "Be prepared" The Boy Scouts solemn creed. Phoenix Fairgrounds, McDowell and 19th Ave.
permaculture, organic gardening, constitutional rights pavilion, solar power, more! Only $10 admission includes all exhibits, classes and seminars, kids under 12 FREE. Petting zoo too! Lots of freebies from the vendors. Last-minute chance for vendor space still available, visit the website. More than $12,000 in prizes, including two $5,000 grand prizes. I'll be autographing books, answering questions. 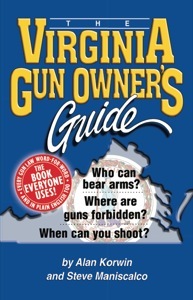 My latest (14th) book -- for your gunless friends. 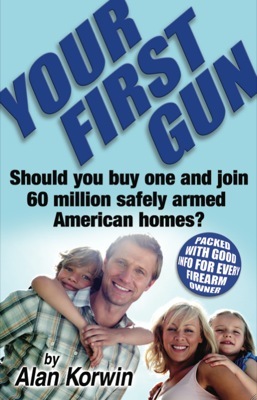 Help us add one million new gun owners. ABC, CBS and NBC gave more airtime to the unproven Chris Christie traffic-jam controversy at the GW Bridge, in less than 24 hours, than they gave to IRS targeting political opponents of the president for six months, during an election cycle. That's according to the Media Research Center analysis, reported on FOX News. The "news" media has become one of America's worst enemies. Christie fired a staffer immediately. Obama has fired no one yet. A federal investigation began over Christie immediately. IRS still has no official investigation a year later (though Congress is looking into it, and the suspected lead perp has taken the Fifth Amendment, multiple times, in two hearings, from which you should infer... nothing). Read the photo caption again. Is the man with the RPG really on patrol? Of course not. He is posing for the unnamed photographer. This is plainly evident -- while the other soldier in the picture is strolling casually out in the open, facing no threat. Soldiers on patrol act cautiously and avoid exposure to threats. They do not sight-in rocket-propelled grenades at, well, nothing, while on "patrol in Ramadi" to make interesting images up close for photographers. Staging photos is a flat-out ethical violation in the news business. This is not news. The AP no longer even makes an attempt to hide its lack of ethics. Read the second line of the caption. This is not news, or even descriptive. It is an editorial statement, where the news is supposed to go. It is a derogatory conjecture about the United States. On what do they base this guess? They do not say. Is it based on how hard it was to stage their photo? This is how the AP, now a blatant propaganda outfit, foists its opinions on an unsuspecting public. You would have glossed over this phony tripe if it had not been brought to your attention by an uninvited ombudsman. The media has dropped its use of ombudsmen because they do this. 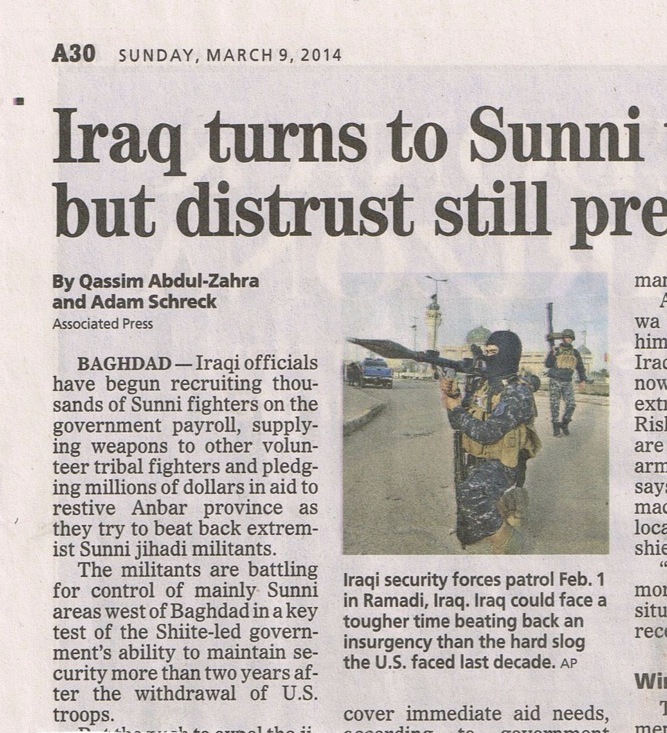 The opening story paragraph mentions Iraqi officials, Sunni fighters, volunteer tribal fighters, and extremist Sunni jihadi militants. Also mentioned in the short clip are Sunni areas, the Shitte-led government, Iraqi security forces and the insurgency. Can you make heads or tails of that? Of course not. Is that deliberate? I can't say, but if I were an English teacher, I would grade writers Zahra and Schreck with an F. Can you identify the person wearing the camouflage -- and face mask -- and does that matter? To quote an American politician, what difference does it make? Righteous, decent people organized into groups just want to fight the powerful gun lobby and save little children. They would never do anything to ban guns or ammunition or act outside the law. They would certainly never do such a thing repeatedly. The National Shooting Sports Foundation reports that: "NSSF, the NRA, Safari Club International and the Association of Battery Recyclers have filed a joint brief supporting the Environmental Protection Agency's rejection of a second attempt by a Center for Biological Diversity (CBD)-led coalition of anti-hunting groups to ban traditional ammunition. "The CBD's first attempt to ban the use of lead ammunition for hunting was denied by EPA in 2010 on the grounds the agency did not have the legal authority to regulate ammunition under the Toxic Substances Control Act. This decision was subsequently upheld by a Washington, D.C. federal court that dismissed CBD's challenge. "In 2012, the CBD and 100 other organizations filed a second submission demanding that EPA regulate lead ammunition under TSCA. The EPA rejected CBD's 2012 petition concluding it was substantially the same as the one filed in 2010 and, therefore, did not require agency review. The CBD again sued EPA and again was dismissed by the same federal court that found the agency acted within its authority when it determined that the CBD's new "petition" was really a petition for reconsideration. 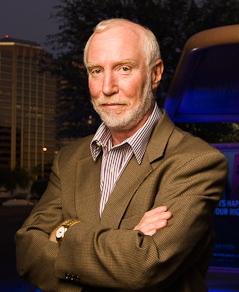 "In the brief, NSSF and the joint interveners agree with EPA that CBD should not be able to circumvent procedural and jurisdictional requirements by resubmitting virtually the same petition, with the addition of non-essential parties and irrelevant information, less than two years after the submission of its first petition. Clearly, the CBD's serial petitions and lawsuits constitute an abuse of administrative and judicial resources and serve none of the TSCA purposes intended by Congress." Once the anti-rights minions have a ban on lead ammunition for one purpose, they will move on to ban ammunition for all purposes, despite their repeated and shallow denials. Repeated use of the courts, against expressed prohibitions not to, shows their true colors. A package of anti-rights bills was recently introduced in Rhode Island covering a wide array of ineffective and disproven gun control schemes. 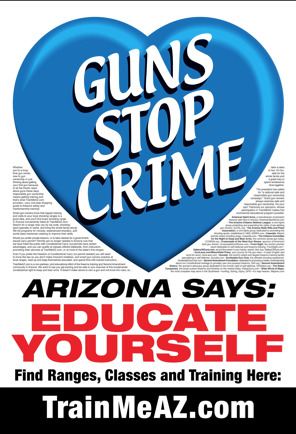 State Rep. Joseph Almeida has introduced bills that would ban semi-automatic firearms, outlaw magazines over 10 rounds, and even advocate the confiscation of magazines greater than 10 rounds owned after Jan. 1, 2015. Almeida has been a long-time supporter of stripping away the rights of law-abiding citizens instead of focusing on criminal activity in the capital city of Providence. Fortunately, the Rhode Island Joint Behavioral Health and Firearms Safety Task Force, formed by NSSF-supported legislation in the last session of the state legislature, released its final report which focuses on allowing the state to submit mental-health records to the National Instant Criminal Background Check System (NICS). Rhode Island was one of the states targeted in NSSF's nationwide FixNICS campaign that seeks to get the records of all prohibited individuals submitted to NICS. It is clear that task force members have agreed with the firearms industry on this important issue. 3- "Insanity" Is Now Gun Control -- Are You Nuts? The under-recognized threat of "you're a mental case." are typed by clerks into the NICS Index controlled by the FBI. It all sounds pretty, and normal, and easy to support. The NICS INDEX is now the standard gun ban for America. Connect these two seemingly distant facts and you have a formula for expansive gun-rights infringement. The Brady handgun bill, the bill that would ONLY require a waiting period for handguns, is now the tool for banning PEOPLE (not guns) from their rights. Forever. It established the NICS check, and worse, the NICS Index, the list of banned PEOPLE. The list grows and never shrinks. It is managed by unelected bureaucrats, administered by low-wage functionaries who answered classified ads for jobs, and are now sitting in air-conditioned cubicles in offices in Clarksburg, West Virginia. American citizens' gun rights are removed by typing their names into a computer, often with no advanced warning or practical means of rights restoration. You aren't even notified in many cases. You don't even have a way to legally find out if you're in there. Why aren't all NICS-check violators arrested? Reasons for typing your name into this nefarious, insidious, unconstitutional, inescapable rights-denying computer file are growing, with glowing support from people and groups supposedly dedicated to saving your right to keep and bear arms. This could signal the virtual end of gun ownership, as it slips into the law books, administrative procedures, local state offices, and affects everyone who has ever: taken a pill, spoken the wrong words, or been "diagnosed" by -- a cop, judge, spouse, teacher, neighbor, or even a foot doctor or dermatologist (or even a shrink). Obama's executive-order directives seek to have doctors question patients about gun ownership, with control of that information about as well managed as the NSA or IRS handles their affairs. is a battleground for our rights we have not recognized yet. The quiet "reasonable" drumbeat to find and lockup the crazies is not getting softer. Everyone is afraid to speak out against mental health -- and the priesthood of head doctors running that crazy carnival. 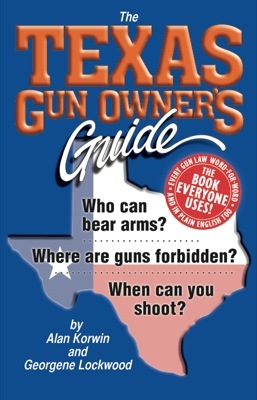 Eventually, the propagandists who are already attacking everything about gun ownership will slip into the obvious -- the very desire to even own a gun is practically proof that you must be nuts. What sane person would want to own a killing machine, right? Someone must speak truth to this growing power that, like politically correct speech, threatens to overtake us. Who will lead this charge? What form will it take? 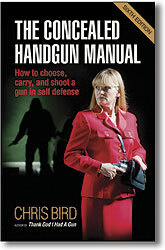 The major gun-rights groups are pushing to get mental cases into the NICS system. The authorities are pushing to get more people classified as crazy. Put two and two together folks. In a report I plan to get to, but may not get to, U.S. Attorney General Holder, who is in Contempt of Congress but still holds office, seeks to change the definition of who is mentally incompetent, for the purpose of denying the right to keep and bear arms. In the Federal Register, Vol. 79, No. 4, Tue., Jan. 7, 2014, Proposed Rules, he proposes an amended definition to "Adjudicated as a Mental Defective" and "Committed to a Mental Institution." "Adjudicated" would include "determinations by a court, board, commission or other lawful authority..." (my emphasis). That strikes me as WAY too loosey goosey for this or any other government office to use to deny a fundamental right. A person who "lacks the mental capacity to contract or manage his own affairs" falls into the net. Can you manage your own health-care affairs, or do you need a health-care navigator? Would that count? "Mental disease or defect" is not defined in the proposal, but the proposal assures us it, "would clarify, rather than alter, the current meaning of the term." It would however now apply the terms to "a court in a criminal case" so it would include "federal, state, local and military courts," the effect of which is unclear. Local courts typically cannot handle felonies (real criminal matters) -- only local ordinances, petty offenses and similar. Are they now included in issuing charges that can deny your right to keep and bear arms? Why else would they be included? Diseases as you know are caused by pathogens, but mental disorders are psychological things that do not involve bacterial or viruses, leaving the whole field open to interpretation. Further, "committed to a mental institution" would now include both inpatient and outpatient treatment, which is currently undefined. Bottom line, mental conditions that would get people onto the NICS Index will expand dramatically, in unpredictable ways, under Contempt of Congress Holder's proposal. I guess I now have reported on this, at least in summary fashion. My copy of the Register is covered with notes. This will have to do or I'll never get it released. 4- Cold Dead Fingers -- Baloney! HARTFORD, Conn. (AP) — Connecticut gun owners are rushing to register certain firearms and ammunition that will be considered illegal contraband this year. People have been lining up early in the morning at the state Department of Emergency Services and Public Protection's headquarters to turn in applications for "assault-weapons certificates" and high-capacity magazine declaration forms so they can legally keep the items they thought they currently legally own. Under a wide-ranging gun-control law, passed in the wake of the Sandy Hook Elementary School mass murder, gun owners have until Tuesday to submit the paperwork. The law expanded the definition of assault weapons in Connecticut to include more banned weapons. 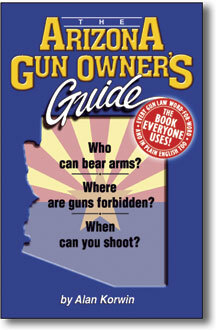 Existing magazines can be kept so long as they're registered with the state. "One thing is clear," Lawlor said. "If you haven't registered it, on the following day, it is completely illegal contraband" starting on Jan. 1. 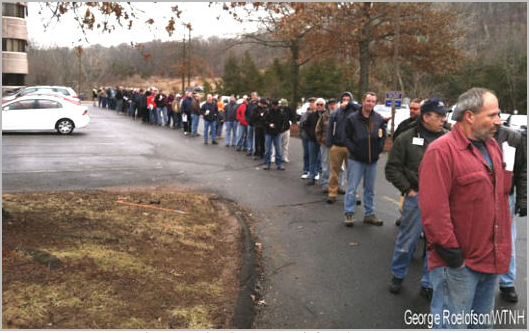 You've probably seen this now-famous image of gun owners lined up to get their "papers." intended purpose -- to stop tyranny in its tracks? Online chatrooms are filled with bragging about all the people NOT on line. Are the "civil disobedients" being smart? What can they do with their unregistered guns, except wait to be arrested? They can't use them, or train with them, or transport them safely. Can't show them off to friends for fear of being turned in. Knowledge of possession is virtually complicity in the crime. "You knew he owned contraband and didn't report it? That makes you an accessory to a felony." Can't bring it to a gunsmith for repair or modification. If agents turn up at your door and demand it, or search -- with or without a warrant -- and then arrest you, who you gonna call? You gonna use it to shoot the poor unfortunate rookie cop with a young wife and two young kids at home, so some sweet blonde reporterette on the nightly "news" can call you a vicious killer living in a compound? Are you going to turn yourself into a set of cold dead fingers then? Will you wish you had stood in line to get your papers? The Connecticut law -- and others like it have turned the people who disobeyed it into felons-in-waiting. 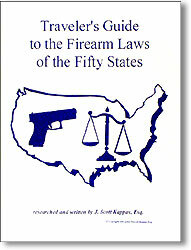 They are in possession of contraband, a Sword of Damocles hanging over their heads, so the first time they have a fire, or a flood, or a home remodel, or a moving man, and the property becomes known, it serves no purpose but to have them scooped up -- and the Second Amendment means nothing but a way to make them submit to the will of an out-of-control government. Terrifying. It will keep you up at night.